When you open the File menu’s Plug-In Extras sub-menu, a number of new menu items will be available. All of these will allow you to open your RAW, DNG and other image files in Photoshop Elements (PSE) without rendering them as TIFF or PSD files first and will also bypass the Camera Raw dialog. Users will typically perform their non-destructive edits in Lightroom before invoking an external editor so rendering files and encouraging non-destructive edits directly in Camera Raw dialog somewhat defeats the workflow that Lightroom supports. If you are a Lightroom 3 user on Windows you will be able to open this sub-menu using the Alt + F, then S key sequence and access these menu items using the described accelerator keys. Lightroom 2 users on Windows can enable the same accelerator key functionality by following the advice in Accelerate Access to Lightroom Plugin Extras. Open in Photoshop Elements menu item will open all currently selected files individually in the PSE Editor. If you have enabled keyboard accelerators (see above) you can use the Alt + F, then S, then O key sequence to open the menu item. Open as Smart Object in Photoshop Elements menu item will open all currently selected files as separate smart objects in the PSE Editor. Please note this will be of limited use unless you are planning to work on these same photos on a system that has Photoshop installed later. While Smart Objects can be created in PSE they can’t be easily modified there. If you have enabled keyboard accelerators (see above) you can use the Alt + F, then S, then S key sequence to open the menu item. Merge to Panorama in Photoshop Elements menu item will open the PSE Editor’s New —> Photomerge Panorama dialog and load all currently selected files into it. You will have an opportunity to modify the panorama type and whether automatic blending is performed before the merging process begins. If you have enabled keyboard accelerators (see above) you can use the Alt + F, then S, then M key sequence to open the menu item. Open As Layers in Photoshop Elements menu item will open all currently selected files as layers within a single file in the PSE Editor. This can be useful if you want to perform some processing (e.g. resizing) of the photos before performing another operation such as merging to panorama. If you have enabled keyboard accelerators (see above) you can use the Alt + F, then S, then L key sequence to open the menu item. Remove Lens Distortion in Photoshop Elements menu item will open all currently selected files individually into the Camera Distortion filter within the PSE Editor. If you have enabled keyboard accelerators (see above) you can use the Alt + F, then S, then D key sequence to open the menu item. When you first try to use one of these menu options the plugin will attempt to locate your latest installation of Photoshop Elements. If you have installed a supported version of PSE in its default install location, the plugin will automatically detect this and the image will be loaded into the editor using the requested method. Fully Compatible, with all Lightroom develop settings supported by PSE "out of the box"
May Be Compatible, meaning that the version of Camera Raw provided by PSE "out of the box" is not compatible with Lightroom. For versions PSE 8 and earlier you can use the Upgrade Camera Raw button to launch the Adobe web page for downloading and installing the necessary free update. Later versions of PSE can be updated automatically via the Help —> Updates menu item. Incompatible, meaning no version of Camera Raw supported by this version of PSE is compatible with Lightroom. You should select another version of PSE if you have additional versions installed, or you may wish to purchase a newer version of PSE for use with Lightroom. It may also be necessary to upgrade Camera Raw to gain support for RAW files generated by newer cameras. The Camera Support Details button launches the Adobe page describing compability between camera models and Camera Raw, to help you decide whether you need an update to support your equipment. Please note that the Skip compatibility check? checkbox can be used to force the plugin to open images regardless of your PSE version&apos;s detected compatibility. Use of this is discouraged as users are likely to encounter error messages in PSE or have Lightroom's develop settings ignored by PSE.. Image Saving indicates whether an image will be automatically saved or whether you must manually intervene before launching one of the menu items. The automatic saving feature is not available in Lightroom 2. Image Depth selects the channel bit depth that will be used when opening the image in PSE. 16 bit gives greater colour fidelity but various PSE filters and features only support 8 bit and will be unavailable for 16 bit images. The plugin&apos;s default bit depth can be changed to address this, or within PSE you can downgrade an individual image to 8 bit channel depth using the Image —> Mode —> 8 Bits/Channel menu item. 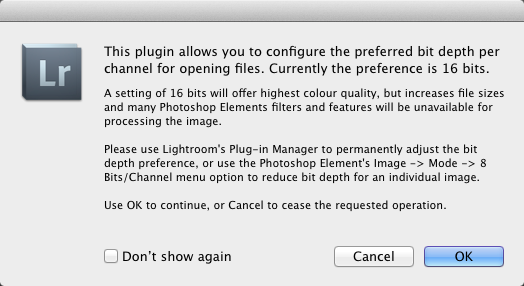 You can change these settings at any time by opening the Elemental entry in File —> Plug-In Manager dialog. There are also a few other dialogs you may see during regular operation. [Lightroom 2 only] First is a reminder to save your files before opening in PSE. Saving your metadata (Ctrl + S, or Cmd + S) writes the Lightroom edits to the photo or XMP sidecar making them available to other applications. If you don’t save your files first PSE will show the initial, unedited image which is unlikely to be what you intended. Once you’ve gotten into the habit of saving before opening you can configure the warning to not show again. 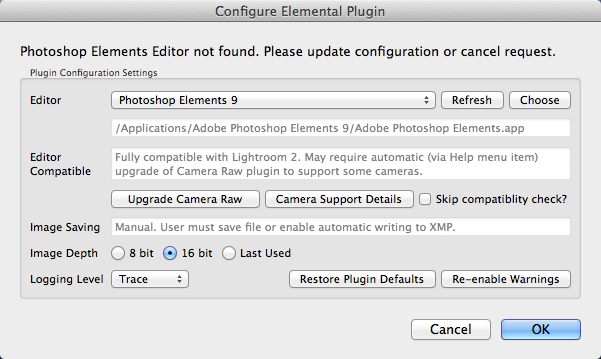 In Lightroom 3 the plugin automatically saves image metadata so this reminder dialog is no longer used. Next is a reminder that displays to explain the current bit depth configuration setting and the implications of choosing 16 vs 8 bit channel bit depths. This has been included to ensure users are aware of the issue and know how to respond when a required PSE filter is not available for use with their 16 bit image. Last is a warning that displays if one of the selected photos is a virtual copy. Virtual copies do not have a dedicated, matching image file so you can’t save the metadata to the file or sidecar and they can’t be opened in PSE. For virtual copies you will be given the option of opening the master file instead, or ignoring the virtual copies entirely. Once again the dialog can be set to not show again if you have a preferred option you will always use whenever virtual copies are selected. At any time you can return to these help pages using the relevant item in the Help —> Plug-In Extras sub-menu.